In this post of Gesture Tutorial, we will make a simple App that will display if you are dragging, tapping or scrolling on screen. 1) Android Studio installed on your PC (Unix or Windows). You can learn how to install it here . 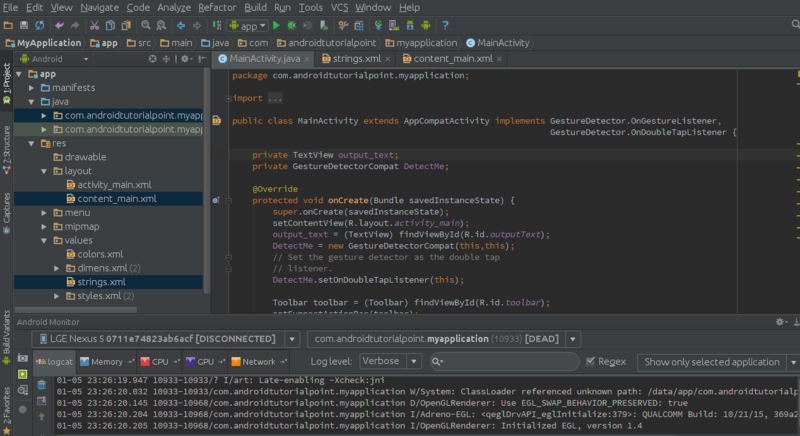 2) A real time android device (Smartphone or Tablet) configured with Android Studio. 3) A basic knowledge of Android lifecycle and different classes & functions used in Android Studio. Let’s start with creating a new project. Open Android Studio and make a new project with name “My Application” and company domain application.example.com (I used my company domain i.e androidtutorialpoint.com. Similarly you can yours). Click Next and choose android version Lollipop. Again Click Next and Choose Blank Activity. Leave all things remaining same and Click Finish. // Following functions are overrided to show text when a particular method called. Let’s go through this code. First we make handle of TextView which is used to display output text on screen. GestureDetectorCompat detects all gestures and events using event supplied by MotionEvent. Moreover, GestureDetector.OnGestureListener will notify user about a particular event and GestureDetector.OnDoubleTapListener will notify a Double tap on screen. We pass GestureDetector.OnGestureListener andGestureDetector.OnDoubleTapListener as interface which are a collection of methods that we can override to include some more functionality. Interfaces in java are same as abstract classes in C++. We are supplying reference id to the output_text and creating object DetectMe. ThisoutputText will be defined as an id in content_main.xml.DetectMe.setOnDoubleTapListener(this) allow us to detect double taps. Now we are overriding predefined functions onSingleTapConfirmed, onDoubleTapetc. to show text on screen whenever they are called. Return value is true so that it can be assured that event is handled properly. Finally we need to override onTouchEvent that will glue together our whole code. This is the default method that will be called whenever a user touches screen. Right now it is checking only touch part. To include gesture in Android Gesture Tutorial App we have to callDetectMe.onTouchEvent(event)before super.onTouchEvent(event). So that’s it. Isn’t it very easy? We have gone through whole code while explaining each line.